In the Catan Card Gameâ„¢ you control a group of settlers taming the lands of medieval Catan. You use the unique card mix to create a map of your own principality. Then explore and settle new lands, acquiring resources through card play and the luck of the dice. Use gold and resource combinations to develop your domain. Expand your settlements and cities, recruit knights, and defend your territory through politics, tournaments, and intrigue! Cunning and a dash of luck decides who will be the undisputed master of Catan! The Settlers card game, obviously, is a spin-off of the ever popular Settlers of Catan board game. This 2-player game works on the same premise of the original Settlers, using resources to build cities and roads, which, in turn, give you victory points. The card game adds a few twists such as knights, and extra buildings that affect your city in various ways. If you like Settlers, give this a shot! 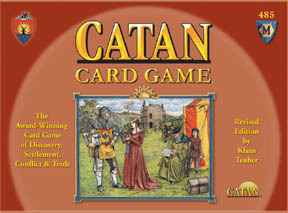 Retains the essence of Settlers of Catan, but executed in a card format. Good for 2 players but do beware that the game time is long, which is good and bad for some. Only problem is that you might be throwing a lot of dice waiting for the right resource as trading, unfortunately, does not happen that much in the game as what resources you own are clearly visible. The best 2 player game available today. Elegantly maintains the basic feel of the original German board game while adding a few twists. There are plenty of ways to win which gives the game a high replay value. Not a quick game, but plenty of turn angst to keep you at the table. One warning: it will take a couple plays to become familiar with all the specific building and action cards. It's worth it. This is an amazing card game adaptation of the Settlers of Catan now classic new generation board game. Is it a clone of the original, modified to fit cards? Not in the slightest! There are elements of gameplay adopted from the original, giving it a Catan "feel", but this is a two player city development game, and its quite its own thing. I love this game, and I recommend it to anyone interested in deep, repeatedly enjoyable games for adults. Not as good as the board game but still decent nonetheless.